List Rules Vote up the movies in which the hero has the least impact on the plot. What would cinema be without instantly recognizable heroes like Indiana Jones, Cameron Poe, Harry Potter, and Luke Skywalker? Well, as far as their stories are concerned, apparently not too different. Of all the great screenwriting fails and narrative snafus, movie heroes who have no effect on the plot is among the most flagrant of sins, yet has produced a number of great movies that don't need heroes. Let's destroy some iconic film characters together, shall we! Raiders of the Lost Ark started this whole debate in the first place. 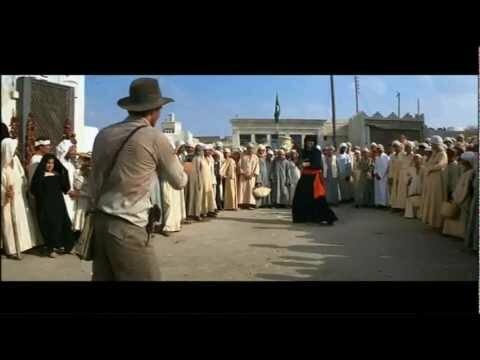 The first installment of cinematic dream-team George Lucas and Stephen Spielberg's classic action/adventure series follows 1930s archeology professor/adventurer/heartthrob Indiana Jones as he endeavors to foil an occult Nazi plot to find and harness the mysterious power of the Ark of the Covenant. It's pretty straightforward: there's a magical box, no one's sure what it does so Indiana Jones (good guy) is racing to get to it before it gets discovered by the bad guys (Nazis, always. Nazis are always bad.). Except that, as explained by Amy Farrah Fowler on The Big Bang Theory, "Indiana Jones plays no role in the outcome of the story. [...] If he weren't in the movie, the Nazis would still have found the Ark, taken it to the island, opened it up, and all died, just like they did." That's important to remember. Indiana didn't stop the Nazis from retrieving the Ark, he didn't even slow them down. He accidentally ended up making it easier for them, in fact, by doing a lot of the legwork tracking it down. Here's the way the movie plays out: Some Nazis try to find an Ark. Indiana Jones tries and fails to prevent the Nazis from reaching the Ark and in fact makes it easier for them to find it. The Nazis open the Ark. The Ark kills all the Nazis for looking at it funny and just generally being Nazis. Indiana Jones quietly brings the Ark to a museum now that literally all of the people who would get in his way are died of complications related to Ark magic. The movie ends with the Ark just sitting somewhere, bothering no one. Here's the way the movie plays out without Indy: Nazis try to find an Ark. Maybe they don't find it because they don't have Indy's superior brain to follow around, or maybe the Nazis eventually find the Ark anyway. Nazis open the Ark and die from mysterious Ark Attacks. Boom: No more Nazis. The movie ends with the Ark just sitting somewhere, bothering no one. Also (and the stakes on this are much lower, we know), a cute little monkey dies because it eats poisoned dates that were meant for Indiana. If Indiana had never stuck his stupid nerd nose into this whole thing, that monkey would still be with us today. This movie makes a big point of beefing up the importance of the titular Inglourious Basterds, but really they're not even all that necessary for the plot. Let's review: they're introduced in the movie as a bunch of tough-as-nails soldiers tasked by the American government to hunt Nazis. Working secretly with British Intelligence, a famous German actress and Winston Churchill (!!!) they are made an integral part of an incredibly convoluted plan that involves sneaking bombs into a movie theater to blow up Adolph Hitler and a bunch of his awful buddies, killing them to death. This would (theoretically) end World War II making the Basterds heroes. It's a good plan and a great motive (it is the official position of this movie that Nazis are bad and Hitler should have been stopped way earlier). By the end, though, the Basterds didn't really accomplish anything. They were discovered by Nazis twice, once in a bar a little while before they were going to put their plan into motion and again by Hans Landa when they're at the movie theater. Landa could have stopped them from setting their bombs off and killing Hitler, but he chose not to, which would have made Landa the war-ending hero of the movie, but it turns out he ALSO didn't need to be part of this particular plot. Shoshana, the farm girl introduced in the beginning of the movie, and her boyfriend Marcel are actually responsible for killing Hitler and all of his buddies. They devised their own plot to kill Hitler (and they didn't even need Churchill's help to do it), and their plan was pulled off successfully. They set fire to the theater where Hitler and his high command were watching his movie, killing him and ending the war. Head Basterd Aldo Raine (Brad Pitt) negotiates a deal with with Nazi mastermind Col. Hans Landa, but that's an incidental detail that has nothing to do with ending the war. In fact, had the Basterds not made a mess of everything, Landa likely wouldn't have known about a murder plot and would probably be in the movie theater with the rest of the Nazis, burning to death. Aww, poor Indiana Jones. Yet again, the good doctor proves worthless, this time in the third (and second best) installment of the venerated series. Indiana Jones and the Last Crusade introduces Sean Connery as Indie's dad, which is interesting, since Indie is basically James Bond as an archeologist. Otherwise, the movie is exactly the same as Raiders of the Lost Ark - the Nazis want a Biblical relic (this time it's the Holy Grail) and don't know where to find; Indie goes on an adventure, during which he accidentally delivers the relic into enemy hands. In the end, it's revealed the Nazis don't actually know how to get past all those great ancient booby traps to retrieve the Grail. Indie helps them, and it's revealed the Nazis don't even know what the Grail looks like. So they wouldn't been able to get it in the first place. So, actually, Indie helps the Nazis even more in Crusade than he does in Ark. Come on, man. Once again, here's the plot: Nazis want a thing. Indiana helps them get a thing. The thing kills the Nazis. Indy's meddling ends up destroying to ancient, booby-trap-filled temple where the thing was kept. Indy loses the important thing. And here's the plot without Indiana: Nazis want a thing. Maybe they find it, maybe they don't, but if they do, the thing kills the Nazis. And this time, the ancient, booby-trap-filled temple stays safe. After being hired by a Evelyn to investigate an affair her supposed husband might be having, private detective Jake Gittes (Jack Nicholson) finds himself embroiled in a conspiracy. Over the course of Chinatown, he uncovers deep-seated corruption and deception surrounding a mysterious family. Gittes plunges deeper and deeper into the darkness and eventually realizes the real, ugly truth (involving sexual assault and a complicated plot of irrigation-related corruption), but it's too late. Terrible events have been set in motion long before he could ever hope to undo them, and he realizes at the same time we do that all of his efforts were destined to be for nothing. Jake is less a hero leading a story than he is a proxy for an audience living in a world in which the machinations of power exist far beyond the grasp of the average citizen. More to the point, does this story need Jake, other than to reveal information to viewers? No. Because his findings never become public, and he effects no change on the status quo. The woman who was assaulted by the powerful man gets murdered, and the powerful people defrauding the people of California get away scot free. Jake's buddy tells him at the end of the film to "forget about it," and then he just freaking does.